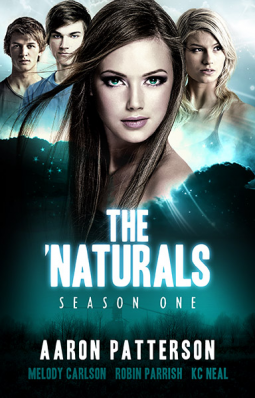 The 'Naturals Season One: "Awakening"
As Summer ends, the students at Silverwood High are getting ready to go back to school and resume their normal, everyday lives. Too bad "normal" is no longer an option. When these teens get their very first tastes of what destiny has in store, will they embrace that destiny... or flee from it? Will they be selfless... or ruthless? Will they master their abilities... or will their abilities master them? This is their awakening, the first step of an epic journey. But it's only the beginning of something bigger than they could ever imagine. This was actually pretty good. Forget being a book series, this NEEDS to be a web series. That would be the most epic thing ever. Someone please tell me it's been made into a web series. I was so surprised at how much I liked this book. I liked all four episodes and was actually disappointed each time that they ended. I guess it's no impressive feat to say I read it all in one night. Less than an hour actually. But that might be something to do with the fact that it's only 49 pages. But it saved me from a reading slump. You know when you can just feel them coming on? I would totally read the other episodes as well. I really need to investigate about getting hold of them. I'm afraid this is a tiny review. I haven't really got much to say or to write about, apart from the fact that if you get the chance to read this, then by all means do. Although I can't decide whether I liked episode 3 or 4 best (Hailey or Israel).